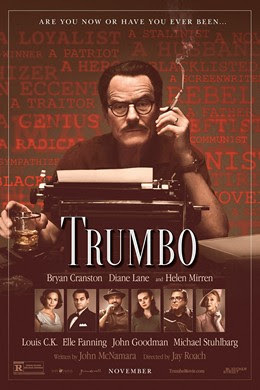 Trumbo will be released in Australia on February 18 and distributed by eOne. Trumbo is a stunning and riveting portrait of old Hollywood which brings to light the extreme injustice inflicted upon important and talented members of the filmmaking community out of fear of their conflicting political beliefs. Eccentric screenwriter Dalton Trumbo (portrayed by Bryan Cranston) was a favourite among Hollywood studios in the 1940's with such credits to his name as Kitty Foyle and Thirty Seconds Over Tokyo. He was also well known for his vocal political beliefs which coincided with that of the Communist party and being a member of the Hollywood 10, a group of directors and screenwriters who were blacklisted after refusing to answer questions and name names in Congress. After being tried, convicted and sent to prison, the blacklist prevented Trumbo and fellow Hollywood 10 members from obtaining work in American cinema. As a result, Trumbo had to find a way to write and make money for his family without the Academy, Screenwriters Guild and the infamous gossip columnist, Hedda Hopper (Helen Mirren) finding out. Jay Roach's first turn at directing dramatic film is an intriguing piece of cinema that only becomes more so as the film progresses. It's sense of intrigue drives this fascinating story which is an imprint of Hollywood history that captures the political climate of the time in both the Southern Californian movie town and the United States as a whole. With the onset of the Cold War, the United States held an increased sense of paranoia. Hence the concern with those who were Communist sympathizers, especially in the film industry where filmmakers have a greater ability to influence by way of their large scale of reach. Hollywood during this time was generally daunted by anything that was considered different in terms of filmmaking and the film industry people, so those who were Communists were part of a minority and ostracised. Trumbo is a fine piece of old Hollywood nostalgia as it captures the time period and it's players splendidly and will be a treat to anyone who is interested in the American film industry's earlier years. The costume design by Daniel Orlandi for both men and women is truly splendid and captures the fashion of the late 1940's and then the early 1950's wonderfully. The landscapes and location shots of North Hollywood and Highland Park are extreme contrasts to the way they are now, as they are far more tranquil and peaceful in the film as the Trumbo family's neighbourhoods than in this century. One of the main features of Trumbo that fans of the golden era will appreciate is that it shows the power that Hedda Hopper really had in Hollywood. Hopper was absolutely ruthless in her approach to obtaining information and getting exactly the outcome she wanted in any situation. She had the power to make or break people's careers and many of the stars chose to share exclusives with Hopper for her column to be on her good side. In Trumbo, Helen Mirren portrays her perfectly as Hopper was known for being able to switch from trying to obtain information by being charming to being manipulative and scheming. The film shows how her accessibility to some of the biggest names in Hollywood including Louis B. Mayer and John Wayne made her so powerful and how in this case she not only used the information for her column, but also to mould Hollywood into the way she wanted it. Bryan Cranston is superb in the title role as Dalton Trumbo as his transformation into the screenwriter with all his eccentricities is a wonderful example of brilliant character acting. 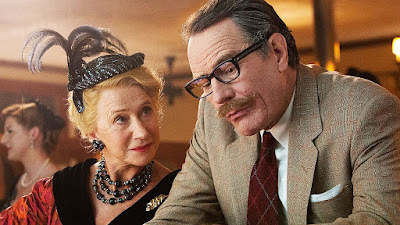 Towards the beginning of the film, it almost feels as though John MacNamara's screenplay has created a glorified version of Trumbo with his frequent long, meaningful speeches. However, when Louis C.K. 's character of Arlen Hird questions Trumbo as to why he has to "say everything like it is chiselled into a rock", this is the end of these long passages by Trumbo and one realises that this was really the way Trumbo spoke until he was tried and convicted. Cranston's Trumbo develops throughout the film and it is evident how his character changed and evolved as a result of the tumultuous events. Trumbo has a number of old Hollywood figures featured in the film that many will recognise. There is a great use of archival footage of actual events and old films in which footage shot for this film of actors portraying certain characters is inserted in. While some of the actors playing characters who are based on real life figures may not exactly physically resemble them, it is incredible how each of them have mastered the mannerisms and voices of their real life counterparts. Michael Stuhlberg is an absolute standout as Edward G. Robinson. He gives a fantastic emotional portrayal as the actor who commits a rather despicable act in the eyes of his friends, but one forgives him when his heartfelt explanation is heard. David James Elliot's portrayal of John Wayne makes him perhaps not as likable as he was perceived, while Dean O'Gorman's Kirk Douglas does quite the opposite. O'Gorman embodies the Spartacus actor perfectly and is incredibly likable leading those who weren't alive in the 1950's to understand Douglas' appeal. While Trumbo is not a proud look back at this time period in Hollywood, it is an accurate and fascinating biopic with a strong screenplay and wonderful performances which make it incredibly entertaining and enjoyable in it's nostalgia.